Thank you to Ryan Breton and the wonderful team at Revolution Hair Design for hosting a cut-a-thon on Saturday November 7, 2015 to benefit Elliot Health System. Proceeds from this fundraiser will go to benefit patients affected by Alzheimer’s disease. View the Alzheimer’s Awareness Cut-A-Thon photo gallery. On Friday, October 2, 2015 over 300 guests attended the 14th Annual Elliot Hospital Gala in support of Elliot Health System (NHHC) at the Elliot. A core group of business leaders, volunteers from the NHHC Advisory Board and the leadership of the Mary & John Elliot Charitable Foundation planned and executed on an evening that was both elegant and festive. The gala included a silent auction, live auction, dinner and dancing. With the help of over 300 attendees, the event raised $90,000 for NHHC. The Foundation sincerely thanks everyone for their support and contributions to make this year’s Gala a wonderfully successful evening for NHHC. View the 14th Annual Elliot Hospital Gala photo gallery. 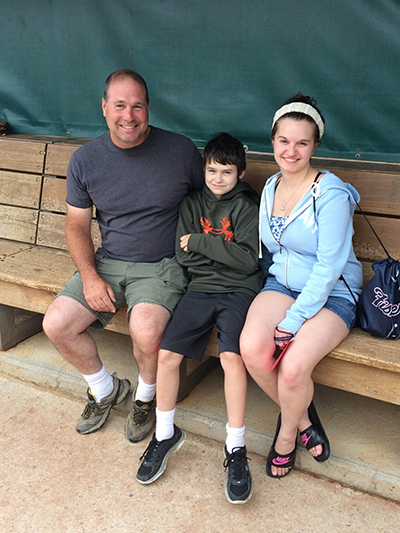 Pictured is the Kneeland Family (Jim, Jacob and Cassie) at the NH Fisher Cats game on Saturday, June 20th. The Kneelands are grateful patients of Elliot Health System and enjoyed throwing out the first pitch and received Fisher Cats jerseys during the Star Wars themed game on June 20th. Teeing Up for Tots a Success for NHHC! 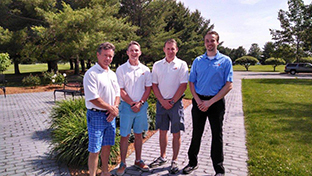 The 16th Annual Elliot Hospital Golf Classic was held on Thursday, June 11, 2015 at Passaconaway Country Club in Litchfield, NH. There were more than 50 sponsoring businesses including Masters Sponsors, EPIC Systems Corporation, Granite Group Benefits, LogixHealth and People’s United Bank. This sold out event exceeded its fundraising goal by netting more than $105,000 for Elliot Health System (NHHC) at the Elliot. The winning group from Cube 3 Studio included Nik Middleton, Peter Bartash, Bruce Ignacio and Keith Boyle. Click here to view photos from the 16th Annual Elliot Hospital Golf Classic. The Mary & John Elliot Charitable Foundation would like to thank everyone who attended the 3rd Annual Korks for Kids wine pairing dinner. The event took place at Manchester Country Club on April 14 and was well attended by 118 guests. This year’s Korks for Kids raised $6,500 which will be used to purchase an infant warmer for the Pediatric Emergency Department at Elliot Health System. Guests enjoyed a three course meal while Ciro Pirone, Director of Italian Wines for Horizon Beverage Company, provided historical information about the wine and commentary on why the selections were paired with each course. Many thanks to The Anagnost Companies, Bellman Jewelers, Horizon Beverage Company, Dr. Holly Neefe and Patricia Spagnuolo for sponsoring this event. We hope to see you next year at the 4th Annual Korks for Kids in the spring of 2016. Thank you to everyone who supported NHHC by attending the Manchester Monarchs game on December 27, 2014. A portion of each ticket purchased went to benefit NHHC. Thank you for supporting Breast Health Awareness Month! The Mary & John Elliot Charitable Foundation netted over $5300 to benefit the Elliot Breast Health Center through breast health awareness merchandise sales and the Give 5 for Fridays program. Thank you to everyone who participated, your support is truly appreciated. Ryan Breton owner of Revolution Hair Design of Bedford, NH hosted a Cut-A-Thon on October 26 which raised $1153 to support the Elliot’s Breast Health Center. In addition to Revolution Hair Design employees donating their time and services, several local businesses donated gifts for a raffle prizes. They included: Goldwell/KMS, USA, Wicked Good Butcha, Johnathan's Jeweler, Douglas Toys, PJ's Florist, Worthen's, Harvest Market, Hannaford, the Copper Door, and Liesl Clark of Claris Photography, Lyndeborough, NH. The Foundation partnered with the British Beer Company to host a “Give Back” night on October 22nd with 10% of the checks going to support Elliot Health System.. If you missed this event and want to dine at the BBC, simply show your Elliot employee badge and you will receive 10% off your bill at the BBC. Hoertdoerfer Dentistry hosted the 4th Annual Big Z Challenge on October 20, 2014, raising almost $10,000 for Elliot Health System. The Octoberfest themed event held at the Elliot at River’s Edge gave 50 fans the chance to spend time with Zdeno Chara, playing games, taking photos and getting autographs from the captain of the Boston Bruins. Proceeds from this event will go toward purchasing a Stinger Mobile Cart for the Pediatric Unit. On Friday, September 19, 2014 over 400 guests attended the 13th Annual Elliot Hospital Gala in support of Elliot Health System (NHHC) at the Elliot. A core group of business leaders, physician’s wives and the leadership of the Mary & John Elliot Charitable Foundation planned and executed on an evening that was both elegant and festive. The gala included a silent auction, dinner and dancing to Clockwork. With the help of over 60 sponsors and hundreds of attendees, the event raised more than $87,000 for NHHC. To view photos from the event please click here. The 15th Annual Elliot Hospital Golf Classic was held on Thursday, June 12, 2014 at Passaconaway Country Club in Litchfield, NH. There were 50 sponsoring businesses including Premier Sponsor People’s United Bank, and Masters Sponsors, EPIC Systems Corporation, and LogixHealth. This sold out event exceeded its fundraising goal by netting nearly $94,000 for Elliot Health System (NHHC) at the Elliot. The winning group from Cube 3 Studio included Nik Middleton, Brian O'Connor, Bruce Ignacio and Keith Boyle. Coming in second was Tom Benz, Scott Schubert, Matt Durkee and Alex Bellman. 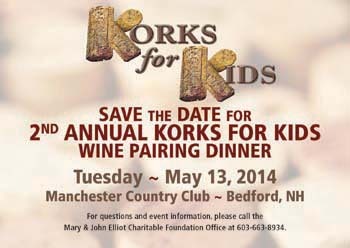 The Mary & John Elliot Charitable Foundation is pleased to share that the 2nd Annual Korks for Kids wine pairing dinner that took place on May 13, 2014 at Manchester Country Club raised more than $6,500 for Elliot Health System at the Elliot! The 100 + guests in attendance enjoyed a three course meal paired with wine from Castello Banfi. Luciano Castiello, ambassador for Banfi, provided everyone with an education on the specific wine pairings and a history of Banfi. Thank you to Ameriprise Financial, Anagnost Companies, Bellman Jewelers, Harvard Pilgrim Health Care of New England, Horizon Beverage Company and Patricia Spagnuolo for generously sponsoring this event. The proceeds from this event will be put toward purchasing a new Stinger Medical Mobile Computer Cart for the Pediatric Unit at NHHC. The 3rd Annual Big Z Challenge, hosted by Hoertdoerfer Dentistry, was held on October 7, 2013 at The Conference Center at the Elliot at River's Edge. Boston Bruins fans had the opportunity to attend an exclusive carnival-themed event with Zdeno Chara, playing games, taking photos, getting autographs, and chatting with the Boston Bruins captain. Fans competed in the "Big Z Challenge", facing Chara in an air-hockey game. Thanks to the event sponsors and everyone who attended, more than $10,000 was raised and donated to Elliot Health System. Annual Elliot Hospital Gala a Success! On Friday, September 20, 2013 over 375 people attended the 12th Annual Elliot Hospital Gala to celebrate and raise money in support of Elliot Health System at the Elliot. A core group of business leaders, physician’s wives and the leadership of the Mary & John Elliot Charitable Foundation planned and executed on an evening that was both elegant and festive. The gala included a silent auction, dinner and dancing. With the help of over 50 sponsors and hundreds of attendees, the event raised almost $77,000 for Elliot Health System. Click here to view pictures from the Gala. Supporters of Elliot Health System raised $764 on August 22, 2013 at the Full Moon Madness Margarita’s Fundraiser in downtown Manchester. The funds were raised from raffles that evening and 5% of the restaurant lounge sales. All proceeds from this event benefit Elliot Health System at the Elliot. Thank you to everyone who came out to support Elliot Health System at the New Hampshire Fisher Cats game on July 16, 2013. Many thanks to those who participated during the game from touring the stadium, throwing out first pitches, live on air radio interviews to playing trivia games- you made it a great day. The 14th Annual Elliot Hospital Golf Classic was held on June 13, 2013 at Passaconaway Country Club in Litchfield, NH. There were 55 sponsoring businesses including Premier Sponsor People’s United Bank, and Masters Sponsors, EPIC Systems Corporation, FTI Consulting and Suffolk Construction Company. This sold out event exceeded its fundraising goal and was the most successful to date by raising more than $100,000 for Elliot Health System (NHHC) at the Elliot. The Mary & John Elliot Charitable Foundation thanks everyone who attended the Korks for Kids wine pairing dinner fundraiser at Manchester Country Club on June 19, 2013. Guests enjoyed a three course meal while sampling wines provided by Horizon Beverage Company, Perfecta Wines, and Crush Distributors. Throughout the evening guests were informed about each pairing selection from Maureen Adams of The Wine Studio and learned about the importance of Elliot Health System from Dr. Holly Neefe, Associate Medical Director - Pediatrics and Dr. Rick Phelps, President and COO of Elliot Health System. With the help of the 100 guests in attendance, $5,000 was raised for Elliot Health System at the Elliot that evening. Thank you to everyone who came out to support Elliot Health System at the Flapjack Fundraiser held at the Manchester Applebee’s on Sunday April 14. With over 70 people in attendance, the event raised almost $350 for NHHC. Elliot Health System physicians, President & CEO of Elliot Health System Doug Dean and members of the community gathered to celebrate the one year anniversary of NHHC. During breakfast at Manchester Country Club, Doug Dean detailed the many accomplishments NHHC has achieved over the past year while Dr. Gilchrist shared his vibrate passion for children. Both Doug Dean and Dr. Gilchrist gave compelling explanations for why NHHC is so important to the southern New Hampshire community. Thanks to the event sponsors and the 115 guests that attended the breakfast, nearly $10,000 was raised for Elliot Health System. 2nd Annual Big Z Challenge a Success! The second annual Zdeno Chara Charity Event held on September 17, 2012 at The Conference Center at the Elliot at River's Edge was a success! $10,000 was raised to benefit Elliot Health System and the Right To Play USA thanks to Hoertdoerfer Dentistry, the sponsors, and everyone who attended.